1. Heat butter and olive oil in a large pan over medium flame. 2. Saute the onions and garlic for 5 to 8 minutes, stirring from time to time. 3. Add the tomato paste and stir-fry for 45 seconds. 4. Pour the stock and add soy sauce, dried thyme, oregano and basil. 7. Add the macaroni and cauliflower pieces. 8. Mix well and bring to a boil again. 9. Reduce flame and simmer for 15 to 20 minutes. 10. Keep stirring from time to time and bring to a boil again. 11. Add the egg and stir for 30 seconds. 12. Garnish with the parsley. 13. Pour into soup bowls and sprinkle cheese on top. 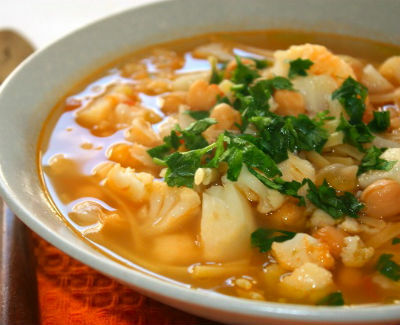 Feel free to comment or share your thoughts on this Cauliflower and Pasta Soup Recipe from Awesome Cuisine.